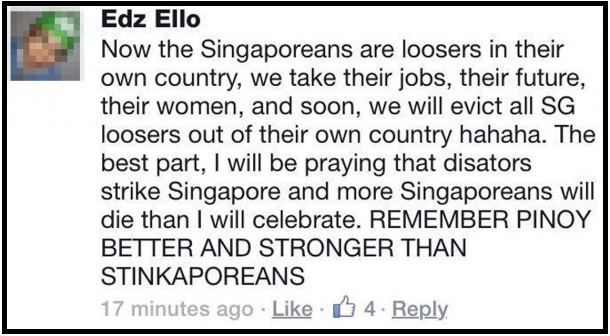 Filipino Nurse Angers Singaporeans By Allegedly Calling Them "Losers In Their Own Country"
Do not bite the hand that feeds you. A Filipino nurse who works at a hospital in Singapore probably has never heard of this advice. Or he may have heard of it but thought it to be not worth following. Just recently, the nurse sparked outrage in Singapore when he posted a series of insulting and hate-driven posts on Facebook. He called Singaporeans losers. He prayed that disasters strike the country. He exclaimed that he and his fellow Filipinos will evict the "losers" out of their own country. The nurse uses the name Edz Ello on Facebook. A quick search on Google says his full name is Ed Mundsel Bello Ello and that he passed the Philippine Professional Regulation Commission's nursing board exams in 2008. He is currently employed at the Tan Tock Seng Hospital in Singapore. "Now the Singaporeans are loosers in their own country, we take their jobs, their future, their women, and soon, we will evict all SG loosers out of their own country hahaha. The best part, I will be praying that disators strike Singapore and more Singaporeans will die than I will celebrate. REMEMBER PINOY BETTER AND STRONGER THAN STINKAPOREANS." Apparently, Ello didn't stop there. 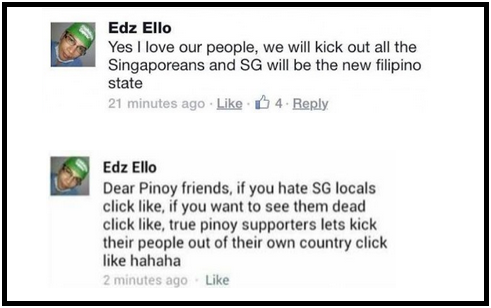 In follow-up posts, he reiterated how Filipinos will kick Singaporeans out of their own country then turn it into a brand new Filipino state. 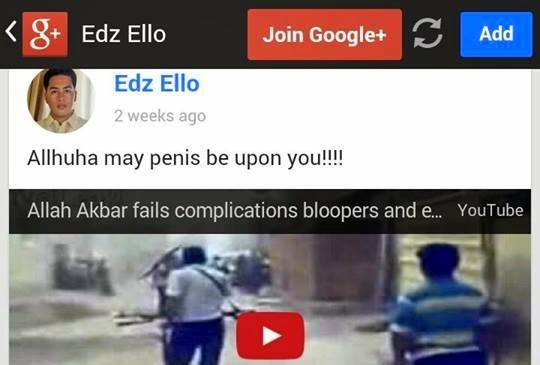 In another tasteless post, Ello tried to rally his fellow Filipinos by calling on them to "like" his post to show their support. Needless to say, it's disgusting. It boggles the mind how a trained professional can utter such shameful things. Naturally, the series of posts by Ello ignited an outrage among Singaporeans. Many of them went online to voice out their thoughts. Several websites and blogs also covered the hateful posts and generated hundreds of comments as people poured in with their opinions on the matter. Tan Tock Seng Hospital (TTSH) was notified of the hateful posts and it immediately posted the following on their Facebook page: "Dear all, thank you for bringing this matter to our attention. We expect our staff to be respectful and professional. Rest assured we are looking into this." Several hours later, the hospital posted an update saying that Ello's Facebook page has been hacked and that Ello has reported the matter to the Singapore police.Here's what TTSH posted: "Dear all, the staff concerned is one of our nurses. He has reported to the police that his Facebook account has been hacked. We are cooperating with the police on the investigation. Thank you for the alerts and concern." Not many people are buying Ello and TTSH's hacking claim. Majority of the hundreds of comments left on the TTSH updates are dismissive of the hacking excuse. Some netizens and bloggers have taken their time to dig up Ello's online posting history and the things they've dug up paint a picture of a person who is very capable of making the hateful posts that Ello claims to have been made by a hacker. If indeed these were also posts by Ello, then we can come up with the conclusion that he can be very strong and often insensitive when he posts his opinions online. Both Ello's Facebook and Google+ pages have been deactivated as of this writing. The hospital where he works also has no further updates about the issue since saying that Ello's Facebook page was hacked implying that it wasn't him who posted the hateful remarks. 1) That Ello's Facebook page was indeed hijacked. If this is the case, then he is one very unfortunate guy for having been the recipient of thrashing for something that he didn't do. 2) That Ello really posted the stuff on Facebook. If this is the case, then shame on him. How dare he spit on the people and country that provide the food that he eats and the clothes he wears. If the Singaporeans kick him out of the country, he deserves it.